I’ve never seen a convincing example of divine intervention in the affairs of men, but those who believe they have may take comfort from something that happened as I was waiting to enter the Provo Center Temple during its continuing open house. While awaiting the film that introduces the role of the temple in LDS life, I found myself sitting near the aisle, next to an empty seat. As family groups passed, each looking to sit together, I watched that empty chair, wondering who, if anyone might be here alone. At last, a woman approached and, after asking if the seat were available, sat next to me. In the time remaining before the film started, she told me that she had grown up in Provo at a time when her ward had no building of its own, but shared a stake center with several other wards. 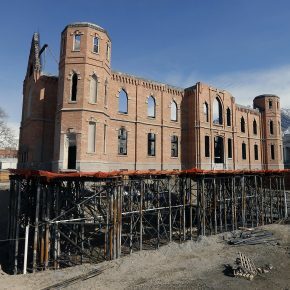 This commonplace arrangement meant that when a large gathering loomed, they met in the Provo Tabernacle, which of course had subsequently been transformed into the building we were about to enter after a devastating fire. She had returned to witness the renewed structure and see how it compared to the one she remembered so fondly. Informed by her recollections, I was able to approach the new temple with a feeling for its history. According to LDS Church historian Scott R. Christensen, there were never more than 100 tabernacles built, mostly by local initiative, and 65 percent of those were subsequently demolished or dispensed with, leaving the remainder rare examples of what might be regarded as an impulse brought along from other practices by converts: one that blended worship and meetings in a single, hybrid space. 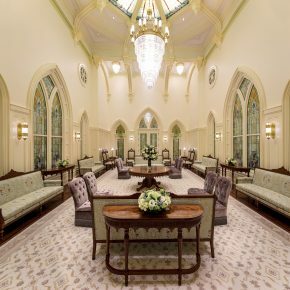 According to Christensen, as quoted in the Deseret News, these buildings, while larger than typical meetinghouses and distinguished by their pipe organs, stained glass, and galleries, defy any single description or definition. Having attended services in a Manti stake center, and gatherings held to share testimony of the Miracle Pageant at the neighboring tabernacle (which was recently renovated without changing its traditional role), I was well acquainted with the difference between those two typical structures: the one a combination of community center and schoolhouse, where sermons alternate with basketball games; the other following a larger, older prototype of a public listening room, where Chautauqua-like public lectures and musical performances may have displaced, or merely come to alternate with, religious services. What I had no comparison for, until recently, was how either of these buildings compared with the increasingly ubiquitous temples, which are proliferating around the world, but also across the heartland of Zion, in what must be one of the world’s great building programs. For an architecture enthusiast unaffiliated with the LDS Church, Utah presents a unique challenge. In many places, churches offer a window into local values, customs, and decorative ideals. Traversing those nations, churches offer places to stop and encounter, indirectly but often more tellingly, both the past and present inhabitants. In Utah, however, one uniquely representative structure, the temple, is off limits to casual entry and inspection. It is possible, of course, to view the outsides of these formidable structures, which can be rewarding: the Salt Lake or Manti temples, with their plenitude of details, from spires to doorknobs, are virtual encyclopedias of 19th-century ornamental lore and a testament to their builders’ devotion rarely seen since the medieval cathedrals. But despite the primacy of the statements made by exteriors, enthusiasts know that the facade, like the human face, only acquires true meaning to the extent that it accurately reflects the interior. The exterior makes an artistic statement, it’s true, but the interior of the building, like the contents of a book, are where that statement is carried out. The true measure of a building is the success or failure of the exterior and interior working together, and that measure can only be taken on foot, by walking around, into, and through the structure. This distinction may help explain controversy, such as surrounds the new Federal Courthouse in downtown Salt Lake City. Those who view it from their passing cars may report seeing nothing but a giant cube, while the architectural judges who award it high marks have walked around, gone inside, and watched it react to the elements throughout the hours of the day and seasons of the year, witnessing it as a living organism. The first objective observation about the new Provo Center Temple will be apparent to anyone. The splendid, symmetrical, venerable exterior, saved from demolition by a remarkable effort employing the latest construction techniques, was preserved intact, although some additions were made to it, such as the emblematic image of the Angel Moroni atop the central spire. 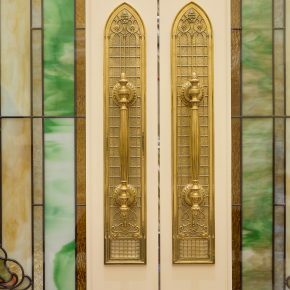 Given present-day temple practice, this means that the porches and doors, like those even more magnificent examples on the Salt Lake Temple, no longer serve any function, other than to graphically represent that the building is closed to conventional entry. Instead, the actual portals can be found underground, a situation that prompted comment even from devout worshippers I followed through this door. Like the Salt Lake prototype, one can enter through a ground-level door in a nearby building that connects via a tunnel, but it appears probable that most who attend will drive into the parking garage and walk from their car to the nearby entryway. This experience, as those around me were noting to one another, can be disconcerting: the open door stands in an area styled as an exterior wall, one marked by classical stone construction and an identifying inscription, but which is also an interior wall, extending upwards not to a pediment, spire, or open sky, but to a flat ceiling, pierced by electric lights, that covers those approaching and extends out of sight in every other direction. As anyone acquainted with the history of The Church of Jesus Christ of Latter-day Saints and the role of the temple will anticipate, exemplary design and workmanship bordering on perfection follow. Where the Provo Center Temple differs from, for example, the Payson Temple that opened just weeks previously, is in the dominant material and the vernacular use it dictates. 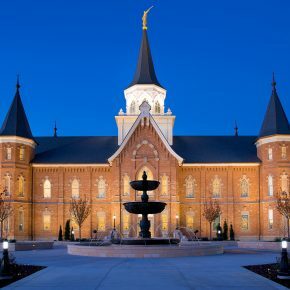 The Payson Temple is clad in stone, paved with a combination of tile and carpeting, and glories in the precision with which such structures as stairways, doorways, moldings, and windows can be conceived and executed in limestone, granite, and marble. 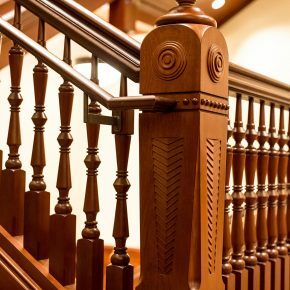 Presumably because of its history, the Provo building features extensive use of wood for these purposes. Even the floors employ parquetry to a remarkable extent, given the heavy use the builders anticipate and the relative impermanence of wood. 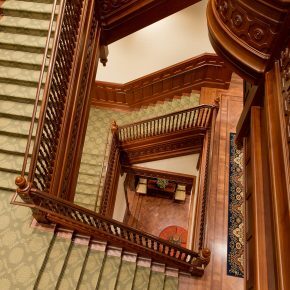 As an historical note, where some wood details in the original were grain-painted, giving available but undistinguished lumber an ornamental flair, the woods that replace them display exquisite, and increasingly scarce, inherent beauty. It’s good to see that, at a time when exotic woods are often used expendably, someone is using them in a way meant to last and be appreciated. Perhaps the most important quality in a building is how it uses space. 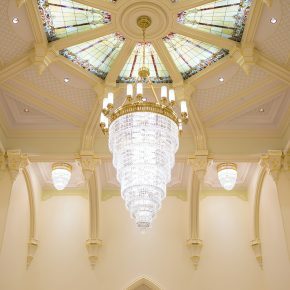 Given the relatively small scale of the Provo Tabernacle, the architects were challenged to create, for instance, a Celestial Room that matches the soaring height and inspiring lantern of the Payson Temple. For a room that, as its name implies and according to the introductory film, anticipates the experience of heaven, individuals will have to draw their own conclusions as to how well this is achieved. Other functional rooms—and of course it is a characteristic of temple design that every room has a designated purpose—anticipate and lead up to this climactic space in a coherent progression—even if it remains unlikely that normal use will capitalize on this progression the way the tour did. Speaking of space, whether bounded by wood or masonry, one thing that the replacement of the lost tabernacle by the new temple signals is what kind of spatial preference is being “set in stone” by those who build these extraordinary monuments. It may help to clarify this if we can compare these temples to another well-known monumental program. During the Middle Ages, Gothic cathedrals grew larger and ever more idiosyncratic as each community of worshippers vied with the others to make a grand, individual statement of faith. Something similar happened after 1850 in the larger LDS community, leading to those hundred or so quirky and unique tabernacles. But during the gothic era, churches also grew more mysterious, their great height and intricate structures not so much bounding space as extending it into ever more porous, soaring visual labyrinths that were pierced by dark, impenetrable arcades alternating with brilliant, luminous stained glass. They became insubstantial and, perhaps, indeterminate. By comparison, in the ever larger and more elegant temples being built today, the spaces, however large, are reassuringly straightforward. They trend away from houses where large numbers may gather to worship together while conducting public business. The jewel box wherein baptisms are performed, with its capacious, gravity-defying font and powerful oxen evoking a great and enduring task, and the Sealing Rooms, every one proportioned for joining two families, each appear to be devoted to a single task. In its heavenly reference, the temple is a sequence of highly determined spaces, and their purposes resonate identically from one temple to the next. There is evidence here of the overarching design of a central authority. And here the judgment of architecture must end and give way to a reading and appreciation of its goals and purposes, which is not an aesthetic question, but a choice of doctrine and covenants, lying beyond the work of the critic. 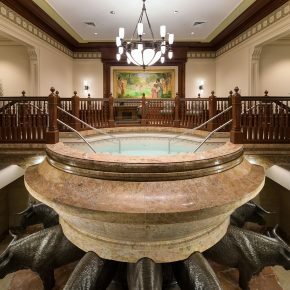 A public open house for the Provo City Center Temple of The Church of Jesus Christ of Latter-day Saints continues through March 5. Reservations to tour the temple can be made online or by calling 855-537-2000.